Capture Fox is a well known Mozila Firefox add-on that can be accessed for free. It was released in July 2008 and is being constantly used for wide variety of applications. Most of the users love to access this software to fulfil their needs of screen recording and voice recording. 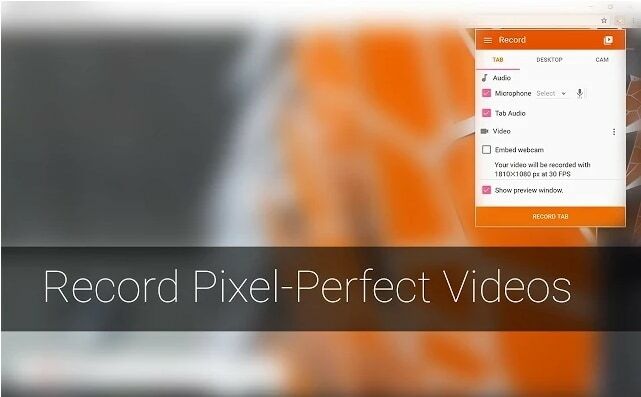 The screencast videos are much easier to develop with the help of Capture Fox. This software is compatible only with Windows platform and can be accessed via Mozilla Firebox of windows version as well as on Firefox version 6 and later. Video files in Capture Fox are generally recorded using Xvid or Motion JPEG technique whereas output file is saved in AVI file format. For sound recording supported output file format is MP3 and WAV. Most of the professionals love to use this tool for generation of e-lessons and tutorials as it can also record user voice. The extension works fine on Window 7, Vista and XP platform. But it is not available now. However you can find alternatives below. Here is a simple to use screencast recorder for all Chrome users. It has ability to record videos that focus specifically on tab activities and can also capture audio signals. Screencastify is popularly used for development of presentations and tutorials. Recorded files from the browser screen recorder add-on can be easily shared on YouTube or can be saved over Google Drive with a single click. As this software does not demand any external support from third party software tools so it works perfectly with Chrome boxes and Chrome books. One of the most interesting things to know about screencastify is its keyboard shortcut compatibility that makes recording process much easier. It comes in two variants: Screencastify Lite can be accessed for free with limited features; single user version is available with payment of €20. Here is a fast as well as free software tool available for your screen recording needs. This tool is currently being used by millions of professionals for development of interactive videos that can be shared online. Educators, gamers, businesses and all other popular platforms love to access Screen O matic for their regular video development needs. It assists in easy tutorial development as well as can provide assistance in development of visual presentations. You can avail its free of cost plan for basic recording but that limited recording duration to 15 minutes maximum. Single user type Pro recorder model can be accessed with payment of $15 per year whereas for Site license type pro recorder you need to pay $9 per month. Wondershare Filmora is the most elegant option for your routine video recording needs as it comes with an intuitive user interface and serves with advanced editing features. Whether you are a beginner or a professional dealing with high end videos, Wondershare can satisfy your needs with its fantastic editing window. Free version of this software allows access to basic recording feature whereas the fully featured tool can be accessed with subscription. It never leads to any watermark on videos, not even with the free version of software. Filmora contains lots of advanced filters, transition effects and editing tools. The resultant video files can be easily exported to other devices like Smartphones, gaming systems or tablets. It also provides direct video transfer facility to social media websites like YouTube, Vimeo and Facebook etc. Files can be also burnt to DVDs if you want to use them ahead in future. Filmora is highly suitable for casual video editing needs.